May 23 2018165 Happy Defenestration Day! Happy Defenestration Day! 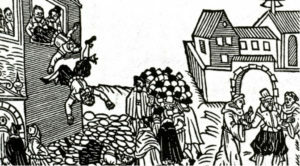 On May 23rd, 1618 a bunch of angry Bohemian nobles shoved some government officials out of a window. The Second Defenestration of Prague kicked off the Thirty Years’ War, but today we mark it as a sesquipedalian occasion to celebrate very large words.